There’s no business that’s perfectly functioning without causing disappointment to it’s customers. Small or large, blunders are inevitable in a typical business setup, but how many companies do actually apologize? In light of the bombed big billion day sale, if there’s anything Flopkart did to become Flipkart again was to say “We are sorry”. The innumerous hassles in placing orders, manipulation of prices, out of stock messages had driven the whole online shopping diaspora angry and cheated. But the big public apology, if anything, made the public empatheticand sure Flipkart’s regaining of trust will take a little more time, but people don’t mind giving it another chance. When do mistakes usually happen? When startups do exceedingly well and reach the 100 crore sale mark, the inevitable happens. They love themselves and complacency prevails! (Read: Robin Sharma article : point 2 success). Success is a scary phase that puts you in a comfort zone and numbs your brain to those instincts that got you there in the first place. This is when mistakes happen. 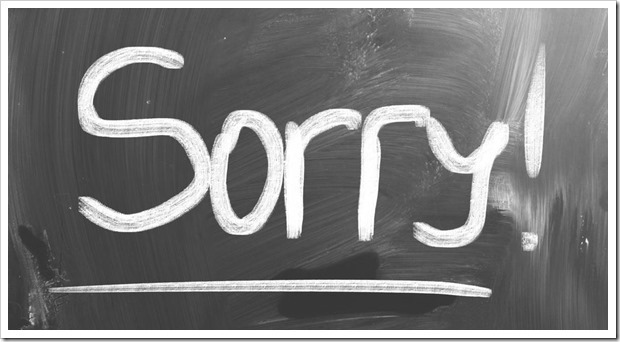 Why should businesses learn to apologize? When someone does something, that gives you a sense of discomfort and disappointment, you can’t deny, a simple apology will put your anger at ease. Forget “compensating” or “making it up to you”, just the plain words put off the fire. Well just exactly how you would to a friend, relative, acquaintance etc except that your words must be formal yet touching. A lengthy one, but note how Flipkart has addressed all the issues in it’s official apology. This move was deeply appreciated by many. There have been many reputed companies in the past who’ve had the courage to come out in light and say “We’re sorry”. In 2013, Pepsico apologized for a racist mountain dew ad where the culprits all shown were black and aired the heaviest accented slurs. “This ad has to be one of the most irresponsible pieces of trash in the history of corporate advertising.”, said a person. Pepsico issued a public apology and this ad was taken off the air. You can check out the Ad. Also noted US company JC Penney had ushered itself into a Ron Johnson phase wherein the company compromised on its brand and started selling low quality stuff. For people who grew up in the US, JC Penney is more than a household brand. Viewing the fall in it’s customer count, JC Penney then fired the brainchild of these ideas, the then CEO Ron Johnson. “It’s no secret, recently JC Penney changed. Some changes you liked and some you didn’t, but what matters from mistakes is what we learn. We learned a very simple thing, to listen to you.” was there official apology. Even Tim Cook apologized to the Apple customer base on the failure of the map app that sometimes gave the wrong directions. Companies like Coca cola, Barclays, NOTW etc have made it a point to do a little damage control because they have now realized customers are in fact the only community that matters to a thriving business. Amazon Planning To Buy Jabong? tycoons are egoistic..they believe that whatever they do is always right.Many investors in Mantri Developers Bangalore(Serenity project @Kanakapura Road) held up since years after collecting full amount as pre-launch offer.Even interest as promised for customers are delayed and left in lurch.People are put into extreme difficulties and helpless since no politician worth his greatness is bothered to sort out/intervene. Mantri’s are known to have lo of clouts in Govt/politics and they get AWARDS for everything !So they are doing what they feel is right and they don’t apologize.Who will tell them to apologize and start up the held up constriuction activities? Firstly thanks for appreciating this article. As you rightly said, many indian companies don’t really see the importance of treating a customer right and in turn they are the losers. The bad word of mouth publicity will eventually hit them hard. As for the awards, no award is bigger than customer satisfaction, when you lose it, you really need “unheard” of awards to claim your quality to keep people coming to you. But there’s light at the end of the tunnel, the new era of entrepreneurs like the Bansal brothers and the like have woken up from their slumber.